Welcome to the website for the Churches of Great Waltham, Ford End and The Chignals with Mashbury. We seek to be a friendly, vibrant, Christian community. Our team is led by Revd Caroline Brown who is also Priest in Charge for the 3 Churches at Great and Little Leighs and Little Waltham. 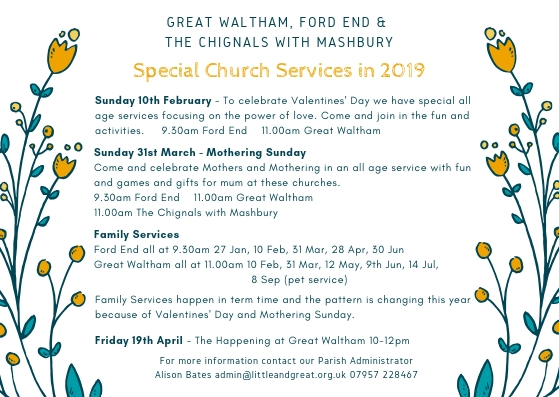 Services and events are held in all 6 of the Churches; services vary in style and form across the Churches and we try to offer something for everyone, so you can worship in the way that suits you. Please explore these pages and contact us if you need us in any way or come and worship with us at one of our services or events.